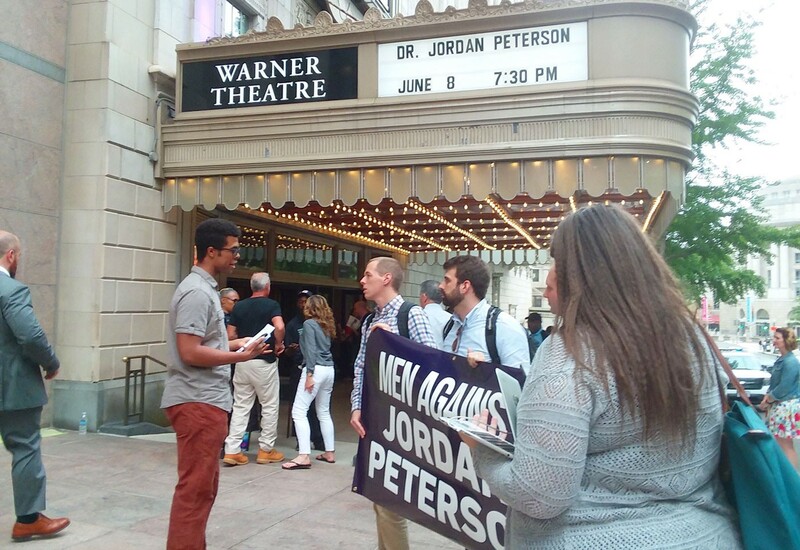 I waffled for weeks about attending Jordan Peterson’s appearance in Washington DC June 8. Despite the controversy his work generates, I see potential for it to bridge cultural divides. Peterson’s ability to stay cool under fire was one of the first things that attracted me to him. So I was concerned about reports by David Fuller and others that Peterson might be losing his cool under relentless pressure, and thus increasing polarization unnecessarily. But the evening assuaged my fears and left me more hopeful that good is coming of the Peterson phenomenon — both in the world and in myself. I attended the event with two new friends I met at a Peterson Meetup in Northern Virginia. We brought flyers to advertise the Meetup. Outside the theater, three young men held up a banner saying. “Men against Jordan Peterson.” A young woman interviewed them while filming for Facebook. Given the makeup of my posse for the evening, I fantasized a counter-banner, “Two women and a dark-skinned guy for Peterson.” But I knew that fantasy was ego based, vamping. I brought to mind a lesson from my other mentor, consciousness philosopher Ken Wilber. “Everybody has a piece of the truth. Even a madman gets some things right.” I used this dictum to great success in my two year adventure dialoguing with the pastor of a Black, Biblical literal church. But there the extreme cultural differences between us seemed to make it easier to come from curiosity. I took a breath and dove in. “What are you most concerned about?” I asked the protesters. They claimed that Peterson distracts from the civil rights debate by focusing on individual rights. He tells young men the frustration they feel is a function of other people infringing on their rights, one of them said. The crowd roared. Peterson got another big laugh when he uttered a sharp “No” before hearing the full question read by Rubin, “Have you ever learned anything from your critics’ attacks on your work?” Rubin paused long enough to let the laughter die. Peterson then contradicted himself; he gave a long discourse on the value of listening to criticism. Joking like this reassured me that Peterson is handling the pressures of fame. In answer to another question, he said his relationship with his family has been strengthened. His wife accompanies him on his tour and remains his best support. What thrilled me most, though, was Peterson’s answer to this ambiguous question. I came out of the evening feeling more fully aligned with Peterson’s work than when I arrived. In “The Death of a Jordan Peterson Fanboy,” Andrew Sweeny warns of the fall that usually comes to those put on a pedestal as Peterson has been. He calls us to “distinguish between the personality and the soul — the spectacle and the essence” of someone whose work we admire. I ended the evening resolved to go a step further, to call myself to be the essence I admire. Regardless of how well Peterson continues to model bridge building, I take responsibility for building bridges myself. I hope to chronicle my successes and failures. Coordinator, DC Integral Emergence Meetup. Author, "The Bishop and the Seeker: Wrestling for the Soul of the 21st Century"